It was at the wedding celebration of Menachem Mendel and Chana Tzivia Lazar, that the groom’s father, Chief Rabbi of Russia Berl Lazar, announced the start of a special new initiative: The Tefillin Bank. This follows the extremely successful Mezuzah Bank, which has helped thousands of Jews put up mezuzot in their home free of charge, thanks to generous sponsors. Needless to say, these mezuzot were just the first step for many of these families, who continued to take on more mitzvot as a result. The Lubavitcher Rebbe started the Tefillin Campaign in 1967. 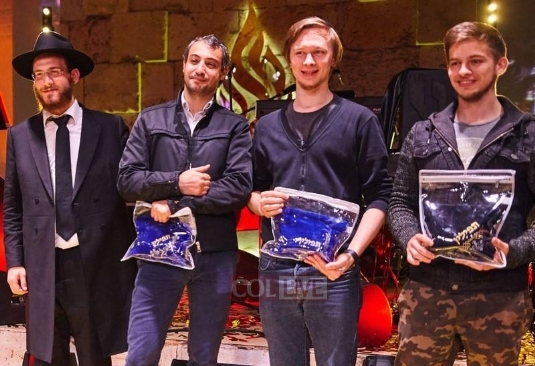 Now, fifty years later, these first three pairs of Tefillin have been paid for and presented to three proud young men who had committed to ‘wrapping up’ daily, but for lack of funds, have been using borrowed Tefillin until now. Their joy at receiving this priceless gift knew no bounds. As the celebration continued, a few generous individuals stepped up to sponsor more sets of Tefillin, so that even more Jews will be able to take on this special mitzvah, which will undoubtedly lead to the fulfilment of many, many more.